From being able to quickly call for emergency vehicles to bring patients to bigger hospitals to being able to receive orders for flowers, residents of Barangay Guba and Bonbon in Cebu City say their lives have improved with the stronger cellphone signal in their area. The two mountain barangays that are an hour’s drive from the central Cebu City business district now have better connectivity after Smart Communications, Inc. (Smart) turned on 2 4G LTE cell sites in the area. With the improved signal coverage, residents can now tap mobile services to improve their lives and boost their livelihood and businesses. Vital facilities like schools and hospitals also benefitted from the improved connection. IMPROVED SPEEDS. The connectivity in Barangay Bonbon, a mountain barangay in Cebu City. Fr. Peter Necesario, parish priest of St. Niño Parish in Guba, said that with stronger signal, they no longer feel isolated, especially during emergencies. “In times of emergencies such as storms, it is easier for us to communicate and be updated about the weather through the internet,” Fr. Necesario said. He added that Guba is a strategically located barangay with a community hospital and church, so communications is very important. Resident Gemma Sandigan, 40, said that the better mobile phone service helps them address the needs of the community, especially on health care. Her father was the former head of Guba Community Hospital. Since the community hospital is small, it can’t cater to complex medical procedures and has to refer patients to bigger hospitals. However, there are times when no vehicles are available to transport the patients. LTE CONNECTION. The improved connectivity allows residents of Barangays Guba and Bonbon to tap online services like live streaming of community events. “With better signal, we can call for vehicles and ask for help in transferring patients to bigger hospitals faster,” Gemma said. The activation of 2 new cell sites is part of a larger rollout plan covering several more mountain barangays of Cebu City at the request of Mayor Tomas Osmeña. The city government plans to deploy new services for these communities that require improved mobile phone coverage and data services. For Gemma’s mother, 62-year-old Emerlisa Veloso, the benefits are personal. She is thankful for the stronger signal because she can now contact her children who work away from home. “Before, we really have to get out of the house just to get signal. Now, we can just stay indoors to contact my children. This is a huge help,” Veloso said. In terms of education, better signal also means improved learning. For 14-year-old Grade 8 student Faith Mae P. Tabal, communication with teachers and classmates for school-related activities has become easier, now that she can use LTE for research and other school work. In Barangay Bonbon, meanwhile, farmers are reaping the benefits of good signal and data connection. Flower farmer Donyo Tapia, 71, said that the better Smart signal has helped him a lot with his flower deliveries. “Stronger signal is a huge help. They (customers) can just call us when they order flowers. Even if we don’t have the flowers, we can still look for them,” he said. Tapia also said they have the phone numbers to the local market and the customers can now call them for orders anytime and anywhere. STRONGER CONNECTION. 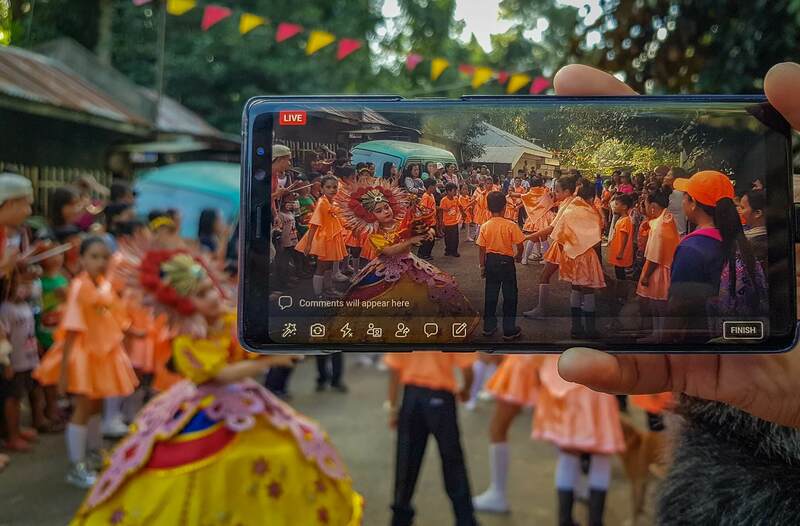 The new LTE connectivity allows students in Barangays Guba and Bonbon to use the internet to research and to link up with family, friends, and classmates. “We can make sure to deliver flowers immediately, especially rush orders, now that the signal is stronger. Unlike before when we still have to go to higher places just to look for signal. It was hard. Now the signal is very strong anywhere,” he added. Another thankful resident of Barangay Bonbon is 50-year-old micro-entrepreneur Marites Cabos. Upon experiencing stronger signal for calls and LTE for mobile data, she now sells Smart SIM cards in her store. “Before we didn’t have network signal from Smart, now we finally have it. We are very thankful because this is a huge help for us here in Bonbon, especially because our children live far away. Now I am also a retailer here because the signal is faster. The LTE data (signal) is now very fast here in Bonbon,” she said. Over 80% of cell sites across Cebu now have LTE. This continuous expansion of LTE services across Cebu is part of efforts to provide the best mobile data experience across the country. LTE is the best technology to help bring fast, affordable and reliable mobile internet services to as many customers as possible. It is also quickly upgradable to LTE-Advanced (LTE-A), which can provide even greater capacity and speeds to users with capable smartphones. In Cebu, major cities like Cebu City, Lapu-Lapu City, and Mandaue City already have LTE-A sites. IMPROVED LIVES. The stronger Smart signal in Barangays Guba and Bonbon have improved the lives of people in the community. Smart has also already fulfilled its commitment to the National Telecommunications Commission to cover at least 90 percent of cities and municipalities to address the growing demand for broadband infrastructure and internet access within three years from the grant of the use of frequencies by the NTC in 2016. Smart has increased its total LTE base station count across the country by 65% in the first three quarters of 2018. PLDT’s fiber optic transmission and distribution network, the country’s most extensive fiber network at 221,000 kilometers, meanwhile, provides high-capacity fiber connections for these LTE base stations. For these continuous network upgrade efforts, both PLDT and Smart have been cited by third party firms for being the country’s fastest networks. Earlier this year, PLDT and Smart were cited for being the country’s fastest fixed and mobile networks for Q1-Q2 2018, respectively, by Ookla, the global leader in internet testing and analysis. Mobile analytics firm OpenSignal has also consistently cited Smart for having the country’s fastest LTE network for its past four study rounds.